The no chu meri and no meris are more difficult for me to play, but tsu no chumeri is what really gets me. I can get the pitch OK, but it's probably 40% volume at its best. Does anybody have advice on how to get the volume up, I have tried playing with my breath etc... but my air seems to disappear from tsu no meri to tsu no chumeri. Also, I have found that covering the bottom of the hole is no different from the top, is this true? First, as you may already be aware, any meri note is going to go down somewhat in volume. More experienced players will have less reduction in volume, but it's the nature of the beast. It's possible to play Tsu chu no meri with no hole shading at all (by the way, as far as I know, you never shade the bottom of a hole), and if you do shade, it's just the slightest bit, just placing the finger at the very top edge of the hole, and applying little or no downward pressure (which will increase the extent to which the hole is reduced in size). Most likely, you just need to do it a thousand more times. Embouchure plays a critical part here. Try playing long tones: Tsu, followed by Tsu chu no meri, followed by Tsu no meri, repeat. Finally: are you sure you've got the names of the fingerings right? Tsu chu no meri is the higher pitched note of the two, followed by Tsu no meri, followed by Tsu dai meri (same pitch as Ro). In descending order: Tsu, Tsu chu no meri (volume drops), Tsu no meri (volume drops more), Tsu dai meri (volume drops even more). The phrase "my air seems to disappear from tsu no meri to tsu chu no meri" doesn't make much sense, as it's very unlikely that you'd be ascending in pitch by playing Tsu no meri followed by Tsu chu no meri, especially in traditional music--not that it can't be done, however, in which case the volume will be increasing from Tsu no meri to Tsu chu no meri. Yes! Tsu no meri is the tough one (e flat on a 1.8). My mistake. Thanks for the advice. Diligence is the only solution, and a lesson or two might help with the getting the details right. There's a whole lotta enso's in this thread! It's actually possible to get tsu meri without any finger shading either, and bending down to that from tsu (kari), over and over and over again, until I wanted to toss my flute out the window, eventually did the trick. Sort of. Still polishing the sound and will be for, well, the rest of my life, I guess. Your teacher (and mine) will tell you to cover from the top and not the bottom (or the side), I'm pretty sure. That's what I thought too, until recently. I met a Myoan player who said they they often cover from the bottom to give it a different timbre. I learned from top down and found it a bit difficult to shade upwards, and also couldn't hear any difference in the tone either. Any Myoan players out there that play this way often? Maybe it's a common practice I just don't know about it. Or it's only a common practice among his particular group. Tani-ha also shade from the bottom. I was wondering if it was just them, but Shimura-sensei told me that's the old way and so he uses that way rather than from the top. He also said about a better tone. Like you though, I couldn't notice. Also since the gap will be higher up, the lower pitch will be more difficult to attain. What stream was the Myoan player from Josh? In Kinko-ryu we sometimes shade from the bottom, before ru on tsu meri. That's because that's the only way most of the old flutes can play Ru, some what approaching the Re pitch and not flying up as when tried by shading the top. It was used out of necessity and then became the established WAY. By the way, I think all this stuff about Tsu meri being hard is a bit overdone to the point that some people have developed a phobia. We must have a special shaku vocabulary word for it. There are tried and sure ways to get a Tsu meri, and Dai meri. Not to worry. I'm working on a self-help book about it. Here's your book title: Living With Traditional "Tsuicidal" tendencies in Shakuhachi music. I'm pretty sure that you are talking about the "ru" in Chikushinkai notation. This is a rather confusing point for cross-school relations, because in Kinko-ryu notation that "ru" is actually "u". (So in Kinko notation there is "u" in otsu, then it's octave is "kan no chi meri", and "kan no u" is below that, i.e. at the pitch of re, so not the octave of "otsu no u". That in itself can be quite confusing, which is why I think it was changed in Chikushinkai notation). In Kinko-ryu notation, ru always means hit the 1st hole. It's quite difficult to hit the 1st hole from tsu meri, so the way it is sometimes done is to start tsu meri by shading from the bottom, then "ru" by kind of flicking the finger from "shading from the bottom" to "shading from the top". (Easier to show, but hope you get the general idea). Yes, I was talking about playing an alternative chi meri where you half hole the #1 hole instead (of the #3), which is easy to do on flutes made to play the Yokoyama style but doesn't usually work on most older flutes. What I was alluding to is that you can sometimes get close to the desired pitch (Re) by shading the bottom half of the hole instead of the top. So, the Ru vocabulary I used was the one I meant to use, referring to the the Ru of Chikushinkai style Chi-Ru-Tsu_Ru but when playing it on older flutes. Yes, it's also easy for people to be confused by all the similiar symbols being used in other schools. Just one more reason I believe people should become very grounded in one style before spreading out to much. hat you can sometimes get close to the desired pitch (Re) by shading the bottom half of the hole instead of the top. So, the Ru vocabulary I used was the one I meant to use, referring to the the Ru of Chikushinkai style Chi-Ru-Tsu_Ru but when playing it on older flutes. Michael, thanks for all your valuable contributions. It's great that someone with your decades of experience shares information with everybody. Unrelated: Do you call that style Chikushinkai? Any Myoan players out there that play this way often? Maybe it's a common practice I just don't know about it. Or it's only a common practice among his particular group. That is the way I learned with my Sensei in Kyoto. I shade ALL meris from bottom up. I attended a couple Myoan Suizenkai and I never saw anyone else use this style of meri. When I had my first lesson I was surprised to see this technique. When I asked my Sensei why, he replied the same as Simura san, that it was an old style and apparently his teachers used the same style. I am currently studying Taizan Ryu which is quite different that Myoan Taizan Ha. Also, I remember there was a post a week or so back about embrochure. In the post the person posted photos of various players using a kind of smile like embrochure. This is also different than the way I am being taught. In the Taizan Ryu style the embrochure is VERY loose and there is NO tension in the mouth. NONE! I say this with emphasis because I was reminded CONSTANTLY about it. I have to say it is VERY difficult after 10 years of studying to start over. It has been taking me some effort to correct all these habits from my past studies. In Taizan Ryu it is necessary to ONLY play basics for 10 years (or at least me...). Only a handful of pieces. But I LOVE IT! In that case, when you come down from (Chikushinkai) "ru" to "tsu no meri", would you keep the "shading from the bottom" position (which you had from "ru" for those shakuhachi) or would you then revert to shading from the top? I think that is the bonus of schools such as Chikushinkai, or Jin Nyodo's school too. They have broad repertoires, but all written in the same style. Kinko-ryu honkyoku, Nezasa-ha, Kansai, Kyushu etc which would all (or many of them) be written in their different styles, with different kana and ways of expressing the sound on paper, but now all written in a standardized way so they can all be read consistently by members of the school. Hats off to Jin Nyodo and Furuya Teruo for their notation! As you say, after that firm grounding, I have found/am finding it very interesting to explore the variety of notation styles. I'm currently studying from the scores of Araki Chikuo, whose way of notating was slightly different from the way of his student Miura Kindo (whose notation for the Kinko honkyoku has been quite standard). We are in the process of publishing the Chikuo scores so they should soon be available. I am currently studying Taizan Ryu which is quite different that Myoan Taizan Ha. Could you tell us more about the difference? Does Taizan Ryu still come from Higuchi Taizan? If so, at which point in the lineage did it split off? Also, what size do they usually play? Also, I remember there was a post a week or so back about embrochure. In the post the person posted photos of various players using a kind of smile like embrochure. This is also different than the way I am being taught. In the Taizan Ryu style the embrochure is VERY loose and there is NO tension in the mouth. NONE! I say this with emphasis because I was reminded CONSTANTLY about it. Wouldn't changing the embouchure affect the pitch? Could this be why some flutes seem to play flat? Ie., using a tight, smile-like embouchure should bring the pitch up some, maybe the flutes that play flat were supposed to be used with that embouchure. I wasn't going to mention anything on this thread because it's way above my head, but it's just a thought I had when I read your post. Justin, I keep the bottom half of the hole shaded on the older flutes when going fromRu to tsu meri because they're not made to be played the other way. With flutes made to play Chikushinkai chi-ru-tsu-ru you just half hole the top half of the #1 hole when going from Ru to Tsu meri. Of course, you know this since you study this style. Good practice though to understand your flute is to play the chi meri half holing #3 and while still playing change to where you open #3 and half hole #1 WITHOUT LETTING THE PITCH CHANGE. You'll have to adjust the chin position on the fly. My question about this aspect of shading the bottom vs. the top on meris is more with the way flutes are made. The air flow is going to be disrupted differently according to each finger position. So, when making a flutes bore shape, doesn't this knowledge (shade lower or upperpart of the hole) dictate some of the shape around the hole on the inside of the flute? Prem, tight embouchures are developed by people who play more ensemble music. And by people who want more control. Loose embouchures allow more breathy qualities to the sound, not something demanded by most ensemble music. Meian players have looser embouchures than kinko players, for example. RadiOgnome, yes the tightening of the embouchure will raise the pitch dramatically. More than half a pitch. You should be practicing going from completely loose to as tight as possible. Both practices in the extreme will lead you places that allow you to produce sounds (and pitches) on your flutes that you wouldn't be able to otherwise. Then practice going from one to another quickly. This tightness vs. looseness can be attributed to the different reactions people have to flutes: one person says the flute plays flat, another says it plays sharp. Much depends on the tradition that you're brought up in. Your teacher says do this and plays like this so you do to. After many years you develop habits. After many more years you un-develop them. Brian, I've started using the word Chikushinkai for the Yokoyama group since that seems to be the thing in Japan now. That was the old name his father was using when I started shakuhachi. They had a monthly magazine at that time by that title, if my memory serves me right. If not, which there's a strong case for, I'll be corrected soon, I'm sure. Thanks for that info! That makes much sense. Since my Sensei only plays Honkyoku I can see why he would value that style of embouchure. I believe that is also the way he was taught by his Sensei. I've got to say it has been quite a challenge to try to maintain a loose embouchure after playing a tighter embouchure for many years. But I enjoy the challenge. Also in regard to pitch of Myoan shakuhachi, I was told by another long time (over 50 years) Tokyo Myoan player and by my Sensei that Myoan "1.8" shakuhachi are LOWER pitch than say a Kinko or Yokoyama 1.8. I believe it is pitched around C#. I say "around" because as it is known, many Myoan players make their own shakuhachi and play only Honkyoku. Pitch of the entire shakuhachi is not of utmost importance. Although contrary to many other Myoan players my Sensei plays his meris very low and playing in tune is very strictly enforced. Justin, I keep the bottom half of the hole shaded on the older flutes when going fromRu to tsu meri because they're not made to be played the other way. With flutes made to play Chikushinkai chi-ru-tsu-ru you just half hole the top half of the #1 hole when going from Ru to Tsu meri. Of course, you know this since you study this style. Interesting. Have you found any tonal difference from shading on the bottom and the top? I personally only consciously make for this chi chi ru tsu ru technique shading hole #1 from the top as that's how I was taught to play it, and the people using my shakuhachi also play it that way, although it does also play fine the other way. In Kinko-ryu the technique doesn't exist, so none of the older Kinko shakuhachi were designed with this in mind. That's why, as you have said, there are troubles of the air flow being disrupted and the note disappearing when you try to get it to the right pitch by shading enough. As for other schools which use this or near techniques, I think many such players of those older flutes (going back to the Edo period) may have had different pitch requirements. So although they may have been playing the same technique, their pitches may have been different from us, and indeed perhaps different from each person to person! Some Edo period non-Kinko shakuhachi will be able to play this technique in tune with our (Chikushinkai) way of playing by not shading hole #1 at all but having a very deep meri, some will need some shading but commonly the ru is possible to get but the chi meri will be sharp, and on others the ru will even be impossible to get, being even as sharp as we would have chi meri, and then chi meri will way sharp from that too. Watazumi's line of honkyoku is very strict about pitch so whereas an advanced player may be able to play this technique in tune with a some of these older shakuhachi, for most players it will be impossible. As for making, there are a number of factors. One simple one is the pitch of chi. Edo shakuhachi have a chi with a higher pitch than we use now. Chi pitch has changed, even for schools which play only honkyoku such as Tani-ha have a lower pitch of chi than in Edo period shakuhachi, so I think we can happily accept that development. Playing with the higher chi interferes with the whole technique, the whole pitch balance. So that is one important factor. Then also the bore, holes and so on. As for the shape of the inside of the holes, the shape changes the tone somewhat. Many modern holes are cut quite straight, whereas older shakuhachi are generally more undercut. I go with the older style. This tends also to help this technique somewhat, but I would use it even for Kinko shakuhachi for players not using this technique. Prem, usually a 1.8 jinashi will have a lower pitch than 1.8 jinuri. That would be why, since I expect your school is using jinashi. It's very interesting to hear about your teacher teaching low meris and strict pitch. Also the loose embouchure sounds interesting. Sounds quite similar to Tani-ha (from Tani Kyochiku) who also use a very loose embouchure and very deep meris. Do you have any sound sample on the net (or to mail)? I would love to hear it. but I tried experimenting with this a little on shakuhachi. The sound isn't breathy at all, and a very surprising result is that it finally got the Otsu Ro on the shakuhachi that I was having problems getting the note up enough to be in tune without breathiness in tune with no breathiness at all. I'm happy, but it's a big change from what I was accustomed to, smiley (with both shakuhachi and silver flute, but more exaggerated on shakuhachi). So you need to purse your lips out so that they stay close to the blowing edge, and, as this will bring the tone down from edosan's suggested method, kari even a little more than he suggests, i.e. more than 45 degrees. The sound will then be clear and "hard" or transparent, in tune, and since the "sixth hole" won't be too big, and your lips are close, there will be less wasted breath and longer, stronger notes are possible. but I'm wondering if maybe he too is suggesting a less "smiley" embouchure. Is it possible to "purse your lips" as he is suggesting and smile at the same time? I'm thinking that the shakuhachi version of what Galway is suggesting (not smiley and with non-center part of the bottom lip protruding beyond the upper lip) could be interpreted as "pursing". When changes (or 'improvements') were made to the shakuhachi during the Meiji, Taisho and perhaps into early Showa periods, the aim was to create an instrument that could do the same things as a Western flute. By making the depth of the utagushi larger and by making the angle sharper - you have to use another blowing technique. 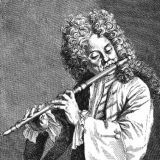 That blowing technique is a more focused breath and with a tighter embouchure (the smile). The sound created would then be more focused and 'pure' - e.g., the opposite of what some in this forum call leaky-iki (which is a great term - not criticising the term here). The 'old' style utaguchi requires a much more relaxed embouchure and the air will be less focused. The timbre created will be softer but less focuse - e.g., exactly the leaky-iki with more noise as well. In it she is referring to changes in the utaguchi that were influenced by Western flute techniques. That could be what I stumbled into here. The "problem" flute I have (which probably isn't really a problem, I'm becoming more and more convinced that the problem is me) is an older Tozan shakuhachi. What I find curious about Kiku's statement is that (I think) she is saying that the shakuhachi were changed to make them play more like modern Western flutes, however that is accomplished with a more "smiley" embouchure while Galway is saying that the "smiley" embouchure with Western silver flute is a no-no. just one more point I'd like to make about getting a good sound quality is to make sure that your are blowing across the wet part (inside) of your bottom lip as apposed to the dry part (outside) of your lip. If you're tending to blow dry, it can cause the sound to all but disappear. The reason I find that quote interesting is that the tighter the "smiley" embouchure I make, the less the wet part of the bottom lip is used. BTW, despite what Galway is saying, there are some very fine Western silver flute players that use a "smiley" embouchure. Maybe he's right and that it's not the best embouchure, and maybe it is holding back those very good players using it from being classed along with Galway, Paula Robison, Robert Aitken, and other exceptionally good players, but the I think it is a bit of a stretch to say that the "smiley" embouchure with Western silver flute is definitively wrong.